I originally posted this tutorial in Jan 2011, and it's been my most read blog post each and every year since! I've finally decided to update it! This is a perfect lazy day rockabilly or vintage hairstyle, for when your hair is greasy or unstyled. Alternatively you can tie the bandana over curlers, so that you can curl your hair for the night ahead. 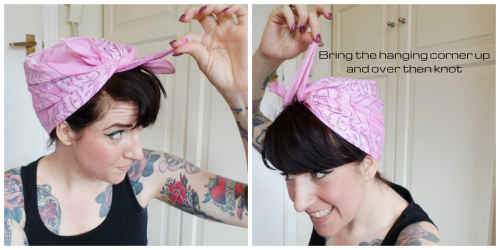 Start with a square bandana or headscarf, and fold the corner over. I usually start with about a third folded, but would make it smaller if I had big curlers in. You'll find the size that fits you best with practice! Place the fold of the bandana against your neck and pull the corners up and together. Keep the pointy corner hanging down over your forehead. Tie your knot over the hanging corner. Bring the hanging corner over and back the first knot so that you can tie a second knot over it. 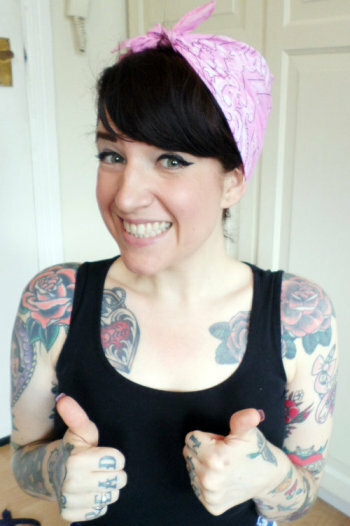 I have also blogged about wearing a bandana the rockabilly way and about what happens at the back of a bandana.